Your 2nd Period Cycle is based on the day of your birth and affects you during the middle part of your life; it is therefore the same as your Birth Day number, but has its own effect. 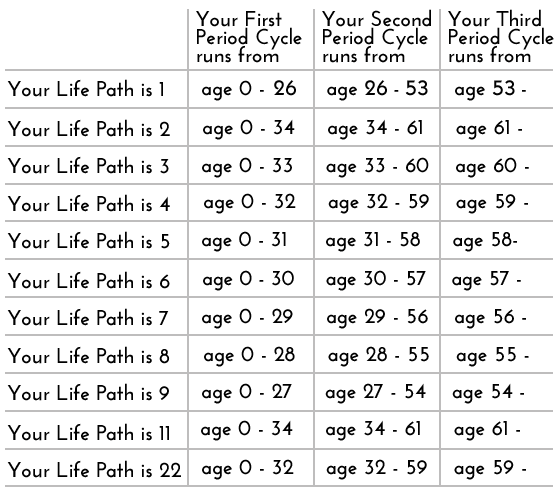 The table below shows the duration of your the Period Cycles based on your Life Path number. It is possible to repeat a Period Cycle. The Pythagorean system, is among the most enduring and popular of all self-help methods ever created. The Chinese, Japanese, Greek, Hebrews, Egyptians, Phoenicians, early Christians, Mayans, and Incas, all employed some form of numerology to gain a deeper understanding of themselves and the universe. 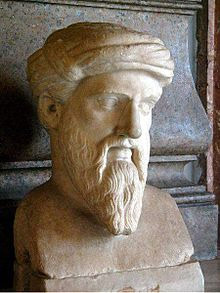 Pythagorean numerology was organized by Greek philosopher and mathematician Pythagoras, born on Samos in 570 BC, and died 495 BC at the age of 75. Pythagoras combined the mathematical disciplines of the Arabic, Druid, Phoenician, Egyptian, and Essene sciences. Since then, it has continued to evolve. The Pythagorean system is today the most commonly used system of numerology in the West.